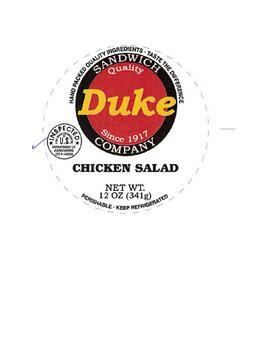 Duke Sandwich Productions of Easley, S.C., is recalling approximately 743 pounds of chicken salad. The product was packaged with two different product names. The chicken salad was packaged in the pimento cheese container, but it had “Chicken Salad” listed on the lid. 12 oz. plastic cups containing the “Duke SANDWICH COMPANY CHICKEN SALAD” label on the lid. The recalled product, bearing establishment number “EST. P-34048” inside the USDA mark of inspection, was sold at retail locations in Alabama, Georgia, North Carolina, South Carolina, Tennessee and Virginia. Consumers with questions may contact Chris Collins at (864) 991-8895, or by email at ccollins@dukebrands.com.